It has been so great to be back in South West Ireland once more. I have been lucky enough to visit here many times in the past, yet I'm still so surprised to see so many new and inspiring things. I have family living in this wonderful area, so I'm lucky enough to have the opportunity of visiting here, at least once a year. Ireland is simply stunning and with the ever changing light conditions, the diverse weather patterns and the many gems still to discover, a visit here is always exciting and never the same. During this particular visit I spent a few days in Drimoleague, which is a small village situated in between the larger villages of Bantry and Skibbereen, in an area that is often referred to as â€˜The Heart of West Corkâ€™. This picturesque area is located close to the mountains and also the stunning untamed coastline, which is a great draw for any visitor. It is also not too far away from the amazing national park at Killarney. In this blog, I will highlight 7 fabulous locations that I think that are worth visiting. These locations must be experienced if you are a lover of nature, history and adventure! 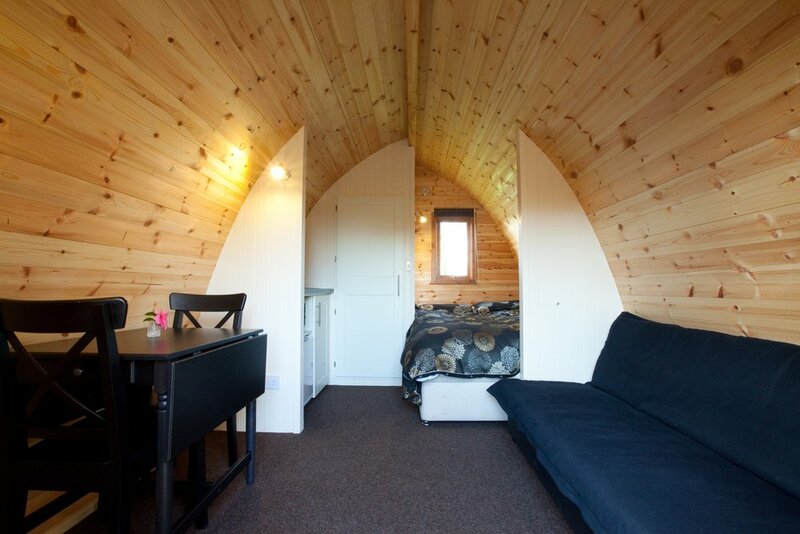 1) Pod PÃ¡irc, stay in style! There are of course many places to stay in West-Cork, but one location I would definitely recommend is the peaceful Pod PÃ¡irc on Top of the Rock in Drimoleague. Here, the friendly hosts David and Elizabeth Ross provided me with the unique opportunity to spend some quality time here. This ancient meeting place is located on top of a mountain, with stunning views over Castledonovan Hills and surrounding landscapes. Views as seen from the Pod PÃ¡irc, looking over the ever changing green hills. It is a very special place, as it is also the starting point of the famous St Finbarrâ€™s Pilgrim Way, which is a walk that leads to Gougane Barra and beyond. Their walking centre provides a perfect venue for couples with miles of walking trails and routes along the river to wander along for mile upon mile. At this friendly family farm, you can experience glamping; the adventure of the outdoors, while still enjoying the comforts of heat, light, a decent bed and even wifi. Traditional camping (with a tent) can also be done. Children can enjoy roasting marshmallows on the campfire, play in the extensive play yard, play games in the stunning Pod PÃ¡irc building, pet the sweetest dog called Daisy and enjoy all of the farm animals that run freely around here. The seven wooden pods come in two different styles. The luxurious version features two comfy beds, a toilet with sink and a mini kitchen. Everything you need, for a perfect stay. I mean who wouldn't want to wake up with the sounds of lambs, ducks and birdsâ€¦ simply nature at its best! 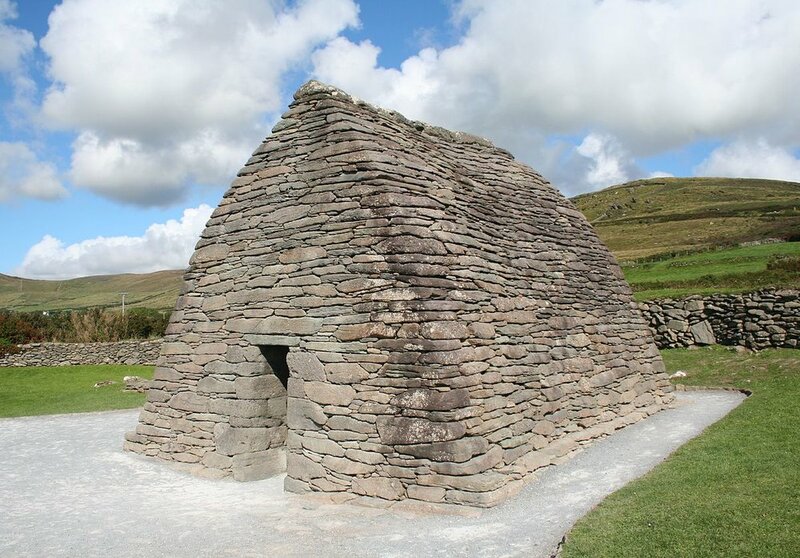 The pods were originally designed by UK engineer Ian Bone who was inspired by early Christian structures such as the Gallarus Oratory beyond Dingle, Co Kerry many years ago. 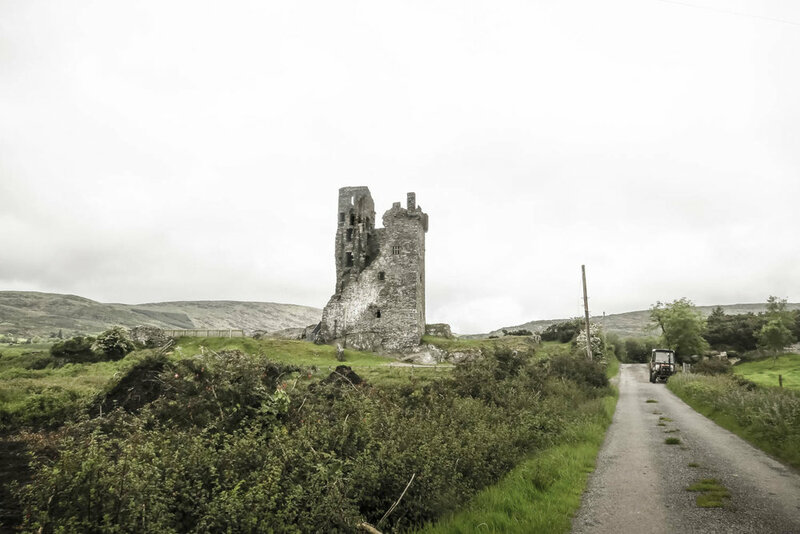 Travelling downhill, by car, through the ever winding roads, from the Top of the Rock towards Gougane Barra, you will pass by the stunning Donovan Castle. Dating back to the 16th century only a small amount still remains, but it provides enough evidence to ignite the imagination, as to what this ancient site was once like. This ancient castle is nestled in the picturesque landscape and can be seen as a prominent feature in the wider surroundings. So you should miss it and is well worth he stop. With so many gems found along the way, take the journey slow and simply enjoy all that is laid there before you. During my travels I ventured passed the fabulous ancient stone circle at Kealkill. The Kealkill stone circle is a significant archaeological site with a radial stone cairn and a pair of standing stones. Visitors to the circle can take advantage of spectacular views of nearby Bantry Bay to the west, Cnoc Baoi to the north and the Sheha Hills to the east. There are many of these ancient sites around, but from this particular location you not only experience the ancient wonders of times gone by, you also have the most incredible views over the bay and the mountain landscape beyond. It is definitely worth a stopping to enjoy this picturesque point on the map. GuagÃ¡n Barra, meaning "the rock of Barra" is a settlement, west of Macroom. Arriving here, you will find a tiny island in the lake connected to the shore by a causeway. It was here, nearby the 6th century, that St. Finbarr, patron saint of Cork, founded his early Christian monastery, before moving down the River Lee to establish a monastery at what is now St. Finbarrs Cathedral in Cork City. There is a small church on the island in this beautiful and serene location, away from the hustle & bustle of daily life. Set on a picturesque location with a richly decorated interior this is a popular place for weddings and a well known photography spot. This little church from the 19th century oratory, stands near the original monastery which dates back to the 6th century. Nearby the church, you can enter the stunning Gougane Barra's Forest Park. 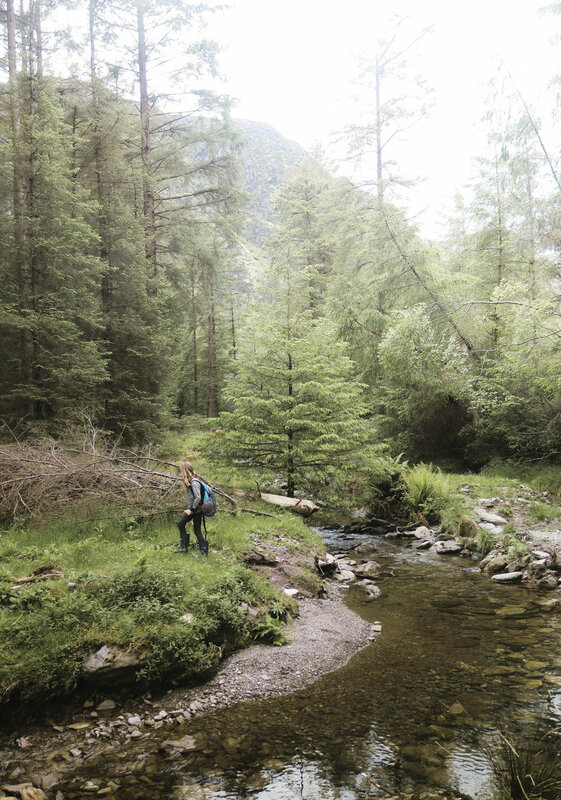 Being Irelandâ€™s first National Park when it opened to the public in 1966, this magnificent Forest Park covers an area of over 400 hectares (1,000 acres). It has some beautiful scenic trails with lots of places to picknick, stunning fairytail paths, little bridges and hillsides. Tucked in a valley it feels like a mini Yosemite Valley. A place definitely worth seeing. Make sure you bring your midget spray! 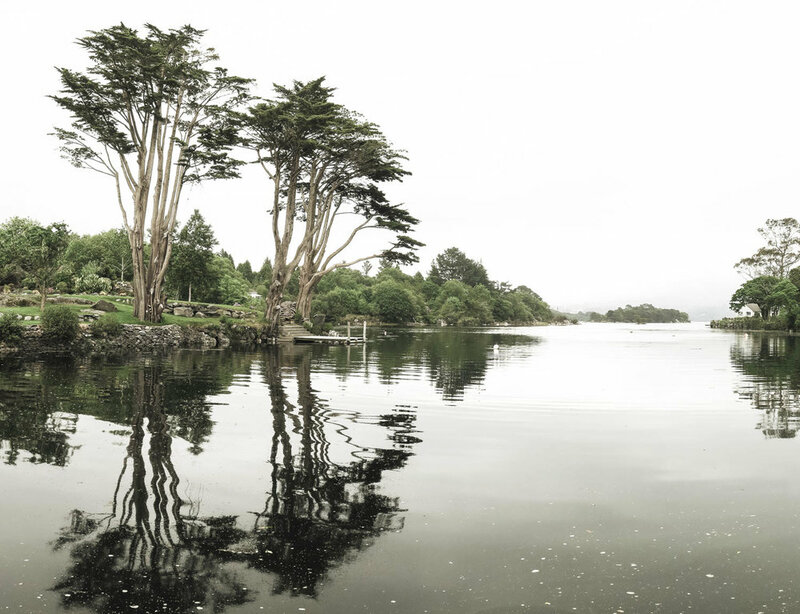 Only a short drive from Drimoleague brings you to beautiful Glengarriff. From here you can take the Garnish Island Ferry to visit the amazing island Botanic gardens. 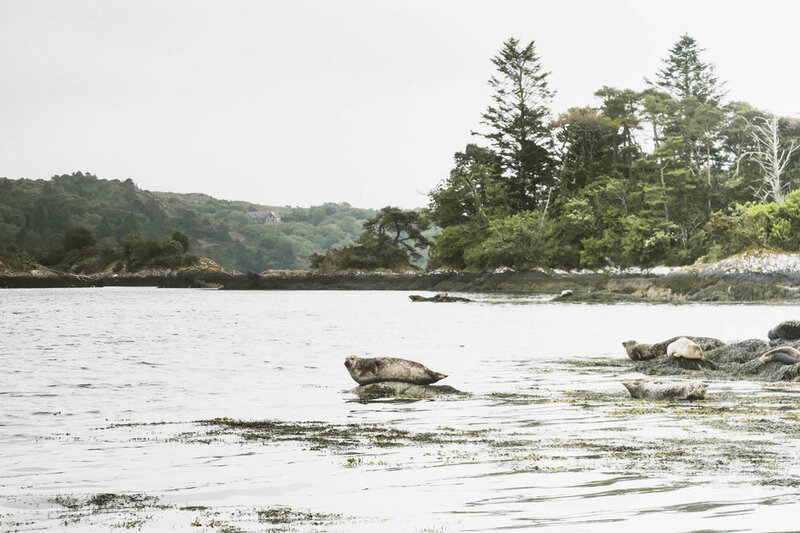 It is definitely worth going there, since from the boat you can admire the magnificent views of the bay and spot many of the photogenetic seals that are catching the sun or taking a rest on the rocks. Also, you will pass a sea eagle who is eager to have his picture taken, since he is ever resting on a trunk on a little island in the bay. So even just for the boattrip, it is worth it. Seals acting like models on the rocks, waiting for someone taking a picture of them. Once arrived, you will find the ticket office and a small restaurant which serves light lunches and general refreshments before or after walking. Garnish is world renowned for its gardens which are laid out in beautiful walks and it has some stunning specimen of flowers and plants which are rare in this climate. The island is laid out in walks and areas as can be seen on the map of the garden. 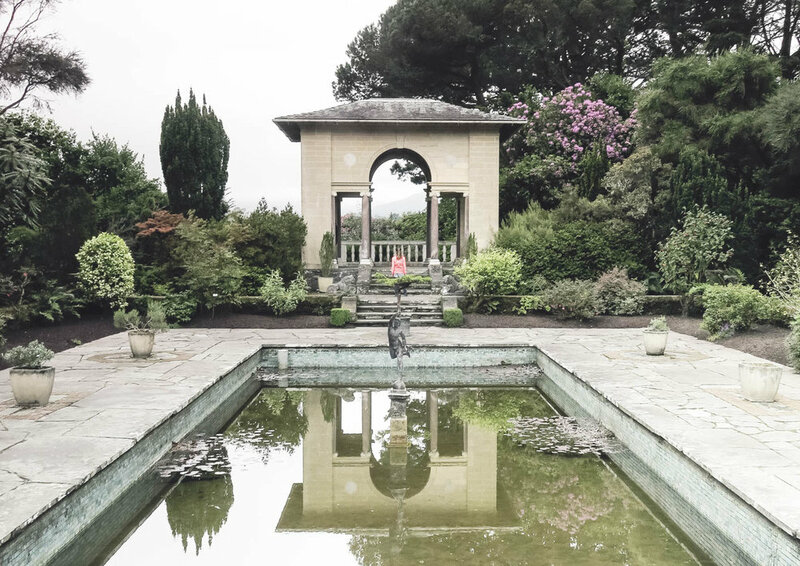 Italian temple in the famed Italian Gardens of Garnish Island, do bring your prosecco! During your walks you will find a diverse range of structures in the gardens, which include the Martello Tower (an original feature of the Island dating from the 1805), a Grecian Temple on the western side, the clock tower adjacent to the walled gardens and the Italian Temple in the Italian Gardens. From these structures, you will have amazing views of the bay. Grecian Temple, great for a picknick or just for staring into the distance. The views from the Martello tower are worth the climb. After visiting Garnish Island we went for a scenic drive towards Adrigole, approximately 16 km over the R572 along the north-western shore of the Beara Peninsula. The Beara peninsula is actually located in two counties: Cork and Kerry, and was named after a Spanish princess, Princess Beara. Since that is route part of the famous Wild Atlantic Way, it has some beautiful sceneries along the way. A tranquil lake we passed, as we went towards Adrigole. Adrigole is a village on the scenic south coast of the Beara Peninsula. Looming over it is Hungry Hill (685m, 2,253 ft), the highest of the Caha Mountain range which forms the spine of the peninsula. For visitors walking the Beara Way Walking route, Adrigole is the perfect place to stay, located midway between Glengarriff and Castletownbere. We made a quick stop here to take in the tranquility of the Adrigole bay. The views while driving on the peninsula are just... wow! Apart from being stunningly beautiful The Beara Peninsula is the place to go if you like peace and quiet roads with no tour buses. The scenic harbour of Adrigole, Beara Peninsula. It is well worth the trip. Take the high tunnel road to Co Kerry and visit Molly Gallivans old farmstead for a guided tour of what life was like on a small farm in the early part of the last century. If you have an hour to spare after that, then a visit to Kenmare is a must. Kenmare is a gem of a town located on a beautiful estuary. Here you will find plenty to see and do with good family restaurants and shops that cater for all ages. From Molls Gap, we head into the the north towards Black Valley. The high tunnel road to Co. Kerry. The road offers some stunning views. This remote location in the Macgillycuddy's Reeks is situated north of Moll's Gap. It is a place of outstanding natural beauty and a hiker's paradise. It is also known locally as 'Cummeenduff' which is Irish for Black Valley. It holds the distinction of being the last place in Ireland to be connected to the national electric grid in 1976 and indeed has very poor mobile phone reception so don't rely on your cell phone to contact the other members in your party. With that said, it is well worth visiting for it's unspoilt natural vistas and hiking opportunities. Please be aware that the land is owned and actively farmed. Respect the farmer's rights, close gates and 'leave no trace'. The views are stunning here. The light continually changes the colors, which is interesting for photography. 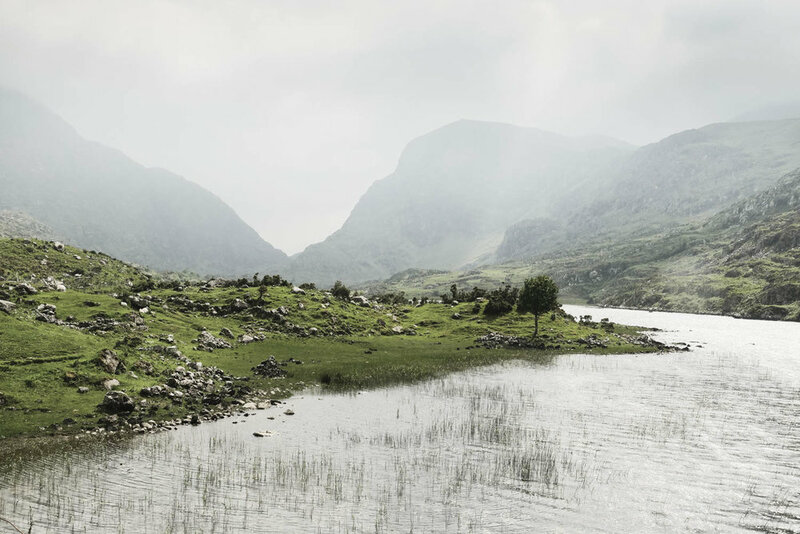 The Gap of Dunloe is a place not to be missed with a wonderful natural scenery. Horseback riding with jaunting cars is very typical in this area and a real must do. 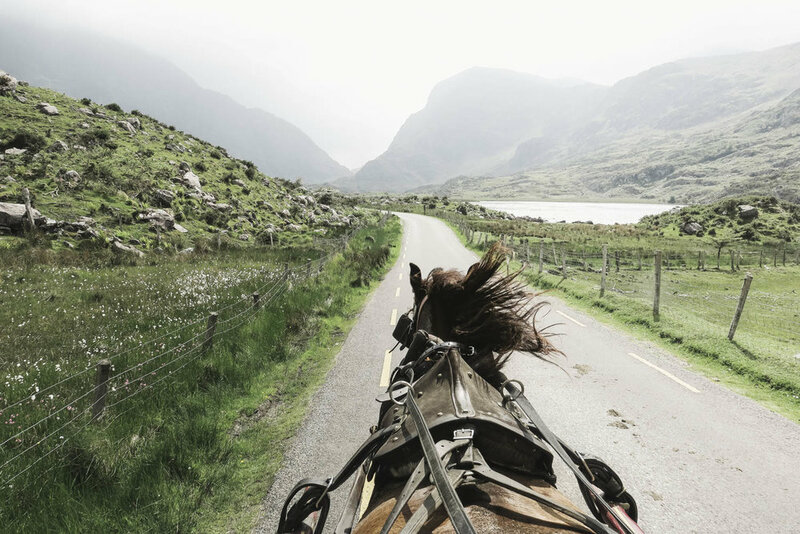 Start from the world-famous Kate Kearneyâ€™s Cottage, situated at the start of the glacial valley, where you can take a jaunting car or go on horseback through the six mile pass which takes you to the end of Augher lake. The Gap is a narrow mountain pass between Mac Gillycuddy Reeks (to the west) and the Purple Mountain (to the east.) En-route you will pass five lakes linked together by the river Loe, with spectacular mountains on either side. Its a unique and bumpy ride, but you'll love every moment, as it is an experience you won't forget. Gap of Dunloe scenic walk. A bumpy, but fantastic ride! Sadly, my time in Ireland has come to an end again. As always, it has been a wonderful experience, as I loved seeing my family again but also, for having the enjoyment of exploring many new gems here in the South-West of Ireland. It is definitely an area that I think should be explored more. I would like to extend a big thank you to The Irish Touristboard and Failte Ireland, for letting me have this wonderful opportunity and for all of their efforts in the organisation and making this trip a great success. If you would like to find out more, then please check here. Check here for more information about The Wild Atlantic Way.